Poland is a nation rich in culture, and musical tradition. In fact, Poland even has five (5) National Dances. There are few countries in the world that have even one national dance. Brazil has the Samba, Argentina the Tango, Cuba has the Rumba, and Ukraine has the Hopak. Haiti and the Dominican Republic share the Merengue as a national dance. Several Middle Eastern countries share the Dabke. Other than Poland, it is only Columbia that has more than one dance: the Cumbia and the Vallenate. The U.S.A. on the other hand, does not have a national dance, however about half of the states have a State Dance, and most of them claim the Square Dance, though Hawaii has the Hula, and South Carolina has the Shag. Plus, in a tradition of east versus west, California has the West Coast Swing (in addition to the Square Dance), while New York has the Lindy Hop (also known as Eastern Swing). Wisconsin and Pennsylvania both claim the Polka. Which leads us back to Poland. No, the Polka is not a national dance of Poland. Poland’s national dances are: The Krakowiak, the Mazur (Mazurka), Polonez (Polonaise), the Kujawiak, and the Oberek. These dances, which originated in the Polish countryside, were so popular that they found their way to the royal court, and were even incorporated into classical works by composers like Chopin. .The Polonez, or Poland Dance of 18th century nobility, has its roots in the 17th century walking dance Chodzony, which traditionally opened up balls and weddings in country villages throughout Poland. Danced to a slow 3/4 tempo, the partners do not face each other, but rather walk to the music around the ballroom… forward, back, side, often bowing, but always maintaining a formal, stately posture. 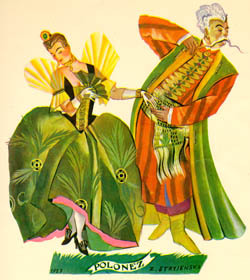 While the Polonez may be danced wearing a folk costume from any of Poland’s ethnographic regions, it is usually performed with the dancers dressed in Kontusze, the costume of the Polish Nobility of the 17th century. The Polonez is still danced in Poland today as the opening procession for student Proms. In addition to the dance, the Polonaise music is often the basis for Polish Christmas carols, Kolędy. The Mazur originated in the Mazowsze region of central Poland in the 16th century, and by the 17th century was danced in villages throughout Poland. With its quick 3/4 tempo…accented on the 2nd or 3rd beat, and intricate steps…heel clicking, slides, and running steps, it soon found its way to the Polish Court. 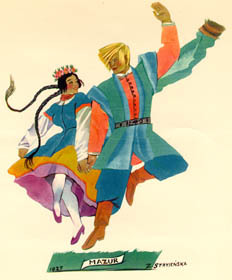 As a result, you will often find the Mazur danced in different ways to different types of music, from the delicate Mazur of the peasants (in regional folk costumes), to the military style Mazur of the Uhlans (soldiers in uniform, ladies in ball gowns). The Mazur is also popular in ballets, like this mazurka from the French ballet, Coppelia by Leo Delibes. Even though it is in ballet form, it has all the elements of the peasant Mazur. So popular is the Mazur in Poland that most of that country’s patriotic songs have a Mazur tempo, including the National Anthem ! (otherwise known as Mazurek Dąbrowskiego). The Krakowiak originated in the southern Polish city of Kraków, Poland’s capital in the 16th century. Known as the Polish dance, the Krakowiak has a 2/4 timing, and is danced in groups, often forming intricate formations, like stars. The steps include shuffling, running, and heel clicking. The costume of Kraków is the one that is most identified with Poland. While the Krakowiak was a popular ballroom dance in Austria and France in the mid 19th century, it is not danced socially today. American Polka bands, however, often take Krakowiaks and turn them into Polkas. The Kujawiak originated in the Kujawy region of North-Central Poland in the 19th century, and was quickly embraced by the gentry because of its dignified simplicity. With a 3/4 tempo that alternates between very slow, and fast, the Kujawiak went through many incarnations as it passed back and forth between the peasants and the nobility, each group adding to the style of the dance. It features spinning turns and elaborate gestures, and is usually danced in a circle. 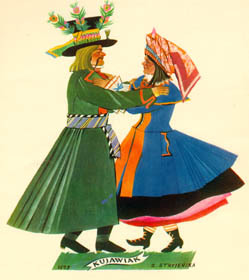 The costume worn by the dancers is that of the Kujawy region. Here are the Polish Tenors with their rendition of a Kujawiak at a recent Przystanek Woodstock performance. The Oberek originated in the Mazowsze region of central Poland in the 17th century, and was played by small village bands dominated by the violin, along with an accordion or bass, and a drum. With its quick tempo, 3/4 timing it soon became popular in almost all of the regions of Poland. 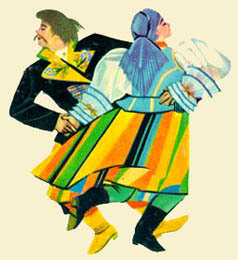 The Oberek is a lively dance with turns and twirls, and the occasional lifting of both women and men. 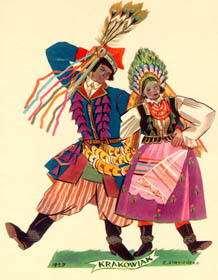 Folk costumes from many regions of Poland are associated with the Oberek, though the Łowicki costume is favored by many dance troupes. The Oberek is still performed socially, especially in North America, though without the lifts. The Moral of the Story is that musical tradition is such a significant part of Poland’s heritage that it warrants Five (5) National Dances !! The early history of Irish dance reveals a constant shifting of population through migration and invasions. Each of these peoples brought their preferred types of dance and music. There are only vague references to the early history of Irish dancing, but there is evidence that among its first practitioners were the Druids, who danced in religious rituals honouring the oak tree and the sun. Traces of their circular dances survive in the ring dances of today. When the Celts arrived in Ireland from central Europe over two thousand years ago, they brought with them their own folk dances. Around 400 AD, after the conversion to Christianity, the new priests used the pagan style of ornamentation in illuminating their manuscripts, while the peasants retained the same qualities in their music and dancing. The Anglo-Norman conquest in the twelfth century brought Norman customs and culture to Ireland. The Carol was a popular Norman dance in which the leader sang and was surrounded by a circle of dancers who replied with the same song. This Norman dance was performed in conquered Irish towns. Three principal Irish dances are mentioned often in sixteenth century writing: the Irish Hey, the Rinnce Fada (long dance) and the Trenchmore. One of the first references to dance is in a letter written by Sir Henry Sydney to Queen Elizabeth I in 1569. “They are very beautiful, magnificently dressed and first class dancers,” Sydney wrote of the girls he saw dancing enthusiastic Irish jigs in Galway. Sydney went on to describe the dance formation, observing the dancers in two straight lines which suggests they were performing an early version of the long dance. During the mid sixteenth century, dances were performed in the great halls of the newly built castles. Some of the dances were adapted by the sixteenth century English invaders and brought to the court of Queen Elizabeth. One of these dances was the Trenchmore, which was an adaptation of an old Irish peasant dance. From this period onward another style of dance called the Hey was popular where female dancers wound in around their partners, in a fore-runner of the present day reel. When royalty arrived in Ireland, they were greeted at the shore by young women performing native dances. When King James landed at Kinsale, County Cork, in 1780, he was welcomed by dancers. Three people stood abreast, each holding ends of a white handkerchief. They advanced to slow music and were followed by dancing couples, each couple holding a handkerchief between them. The tempo of the music increased and the dancers performed a variety of lively figures. Irish dancing was accompanied by music played on the bagpipes and the harp. In the houses of the Anglo-Irish aristocracy, the master often joined with servants in some of the dances. Dancing was also performed during wakes. The mourners followed each other in a ring around the coffin to bagpipe music. During the eighteenth century, the dancing master appeared in Ireland. He was a wandering dancing teacher who travelled from village to village in a district, teaching dance to peasants. Dancing masters were flamboyant characters who wore bright clothes and carried staffs. Their young pupils did not know the difference between their left and right feet. To overcome this problem, the dancing master would tie straw or hay to his pupils’ left or right feet and instruct them to “lift hay foot” or “lift straw foot”. Each dancing master had his own district and never encroached on another master’s territory. It was not unknown for a dancing master to be kidnapped by the residents of a neighbouring parish. When dancing masters met at fairs, they challenged each other to a public dancing contest that only ended when one of them dropped with fatigue. The costumes worn by Irish dancers today commemorate the clothing of the past. Each school of dancing has its own distinct dancing costume. Dresses are based on the Irish peasant dress worn two hundred years ago. Most of the dresses are adorned with hand-embroidered Celtic designs, copies of the Tara brooch are often worn on the shoulder. The brooch hold a cape which falls over the back. The clothes worn by men are less embellished but steeped in history- they wear a plain kilt and jacket, with a folded cloak draped from the shoulder. Male and female dancers today wear hornpipe shoes, and for reels and jigs, soft shoes similar to ballet pumps are worn. Today there are many organisations promoting Irish dance. The Feis has been an important part of rural cultural life. Children, teenagers and adults compete in separate competitions for Feis titles and prizes. There are group and solo competitions where dancers are graded by age from six to seventeen and then into the senior categories. There are dancing championships in all four provinces, and winners of these provincial competitions qualify for the All Ireland Championships. The World Championships are held in Dublin at Easter where dancers from England, Ireland, USA, Canada, Australia and New Zealand compete for the World title. The Irish word céili originally referred to a gathering of neighbours in a house to have an enjoyable time, dancing, playing music and storytelling. Today it refers to an informal evening of dancing. Céilis are held in large towns and country districts where young and old enjoy together group dances. The céili can be traced back to pre-famine times, when dancing at the cross-roads was a popular rural pastime. These dances were usually held on Sunday evenings in summer when young people would gather at the cross-roads. The music was often performed by a fiddler seated on a three legged stool with his upturned hat beside him for a collection. The fiddler began with a reel such as the lively “Silver Tip”, but he had to play it several times before the dancers joined in. The young men were reluctant to begin the dance but after some encouragement from the fiddler, the sets of eight filled up the dancing area. The world-wide success of Riverdance and more recently Lord of the Dance has placed Irish dance on the international stage. Dancing schools in Ireland today are filled with young pupils keen to imitate and learn the dancing styles which brought Jean Butler and Michael Flatley international acclaim. Today there are many opportunities to watch and enjoy Irish dancing. It is still a regular part of social functions. Dancing sessions at céilis are usually preceded by a teaching period where novices are shown the initial steps. During the summer months, céilis are held in many Irish towns. Visitors are always welcome to join in and with on the spot, informal instruction, anyone can quickly master the first steps and soon share the Irish enthusiasm for Irish dance.